Discover the birth month flowers and flower meanings here! Did you know that there are birth month flowers with a special meanings? Most of us know about birthstones, but birth month flowers are just as sentimental. The tradition of assigning meanings and significance to specific blooms became very popular with the Victorians, who raised the use of this secret love language to an art form. One could literally 'read' an arrangement! Consider using mother, father, and baby's flowers, as well as siblings to add meaning and significance to an arrangement. Your local florist should be able to assist you with other appropriate floral selections and help you find other meaningful flower sentiments to fill out your bouquet. Be sure to let Mom know what the special flowers represent in the card that you tuck in. Another very thoughtful option is to give a potted plant or bulbs to be planted in honor of the baby. Remembering that this tradition started before professional florists, most of these plant selections are very well suited to growing in home gardens and borders. These blooms can be enjoyed year after year. In many parts of the country, the plants will often bloom during the month of the baby's birth. Your local nursery will be able to help you select the right plants for your area. Dress up a any of these great baby shower gift basket ideas by tucking in a little arrangement of flowers! You may also consider this chart when selecting charms or jewelry for the baby or expectant mother, such as a locket with an engraved rose for a June birthday. Below you will find a chart with meanings and beautiful photographs. 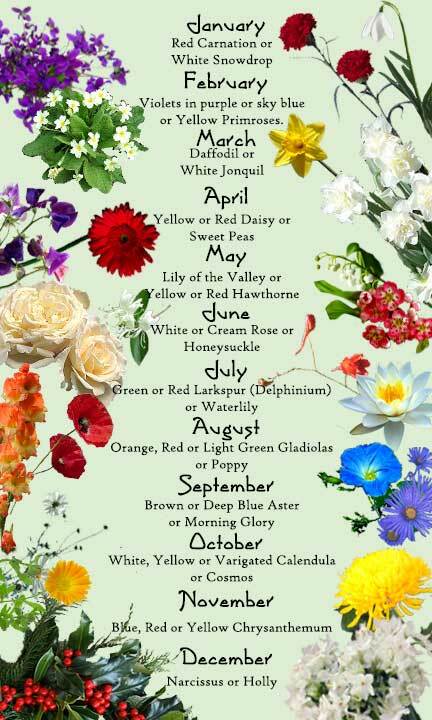 Please click here to find a printable PDF file with the birth month flowers and meanings. bookmark my site so that you can come back again soon!